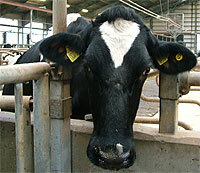 The Danish Cattle Research Centre (DKC) at Foulum (Jutland) opened at 3 November 2000. The Centre is financed by Danish farmers' organisations and built on land leased from University of Aarhus in Foulum, Denmark. The purpose of this centre is to have ultramodern facilities for practice-oriented cattle research. The resulting know-how is to contribute to continuous development and adaptation of Danish cattle farming. DKC-Burrehøjvej: Cowhouse for 210 dairy cows with milking robots as well as housing facilities for 150 offspring, 150 slaughter calves and 100 young calves. The buildings are modern Danish cattle houses, characterised by loose-housing system, uninsulated units and natural ventilation. The centre also includes office, conference and personnel facilities. The total area is more than 6,000 sq m.
DKC-Blichers Allé: Cattle barns including facilities for dairy cows, calves and young stock with focus on performing many different kinds of research and development projects. The overall capacity of the facilities makes it possible to perform experiments including from 1 to more than 70 animals per trial. The units are arranged for maximum flexibility regarding form of housing and project goals. The research activities on the centre are mainly conducted by scientiests and technicians from University of Aarhus in Foulum.